None. Geraniums (pelargonium) are easily damaged by frost. Mix a standard application of a balanced organic fertiliser into the soil prior to planting along with a generous helping of well-rotted compost. 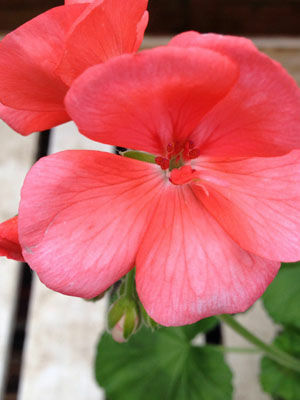 When growing geraniums in containers, use a coarse compost that drains well. Fertilise established geraniums monthly from midsummer to autumn. Lobelia, Alyssum, Rose and Grape Vine. Upright geraniums look best in groups, or as the central focal point in mixed containers. Only a few geranium varieties are available as seed, which tends to be slow to germinate. Most gardeners buy geraniums as inexpensive bedding plants, set out in spring as soon as danger of frost has passed. Many of the showiest varieties are propagated from rooted stem cuttings rather than seeds. Large varieties may need wider spacing, or you can grow them in 35cm (14-inch) diameter containers. Individual geranium plants produce new flower clusters every three weeks when older blooms are snipped off. Trailing varieties are great for containers. Red, white and pink are the strongest geranium colours. Geraniums bloom longer and stronger when old blossom clusters are promptly removed. Geraniums that dry out often can be brought back to life with regular water and fertiliser. Excessive rain can cause geraniums to rot.